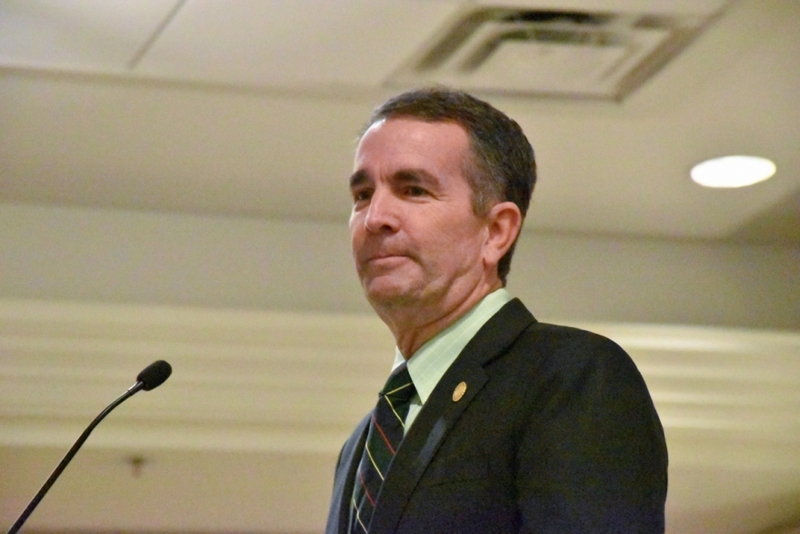 Northam at a conference in March. Gov. Ralph Northam will be greeted with protesters from the NAACP and the Republican Party of Virginia on Sunday at his second campaign event since a racist yearbook photo scandal erupted in February. The governor has resumed many of his public appearances and has received warm welcomes from Democratic lawmakers who once called for his resignation. A spokesman for the Democratic Party of Virginia declined to say whether its rescinded its call for Northam to step down. But he did not appear at campaign events until Wednesday, when he appeared alongside Betsy Carr (D-Richmond). Sen. Dave Marsden (D-Fairfax County) invited Northam to attend Sunday’s Campaign Kickoff BBQ, according to Northam’s communications director Ofirah Yeheskel. Kofi Annan, president of the Fairfax County NAACP, said the spate of appearances were premature. He called Northam’s denial that he appeared in the photo “garbage” and urged governor to apologize. “He should not be allowed to be touring around the state, doing fundraisers, or doing anything, because he has hurt a lot of people, and shown no remorse for that,” Annan said. Annan said he’d had conversations with Marsden and a member of Northam’s staff. Marsden “repeated some of the same talking points that the governor’s put out”--t hat Northam wasn’t in the photo, and was working to find out who was. Northam’s staff “offered to have a dialogue” about issues dealing with racial equity, an offer Annan said did not address his concerns with the photo. Shortly after the scandal broke, The New York Times reported that Northam was considering hiring a private investigator to look into the photo. Yeheskel didn't respond directly to questions on whether Northam had done so. “I don't have an update,” she said. The Republican Party of Virginia is organizing its own protest against Sunday’s event. “Northam is trying to sneak back onto the scene after putting our commonwealth in a very embarrassing spotlight,” the party said. In a statement, Marsden called demonstrations a fundamental right of democracy. Northam’s political problems will likely hinder his ability to play roles traditionally played by governors in statewide elections, according to Univ. of Mary Washington political science professor Stephen Farnsworth.